As the Oilholic headed for a splash and dash visit to the familiar surroundings of Vienna on another early morning British Airways flight to the Austrian capital on Friday (November 23), one couldn't but help notice that yet another oil futures selloff was underway in Asia, with regional closing trends indicative of 2% declines. By the time this blogger landed at Vienna International Airport at half past noon, the decline had become more pronounced in European trading hours. And a few hours later in the US, the intraday rout was complete with both WTI and Brent front-month contracts registering declines of tad over 7%. What is worth noting here is that the latest drop is the third such decline - not just in the quarter, or on the month, but in the short space of a mere 10 trading sessions. 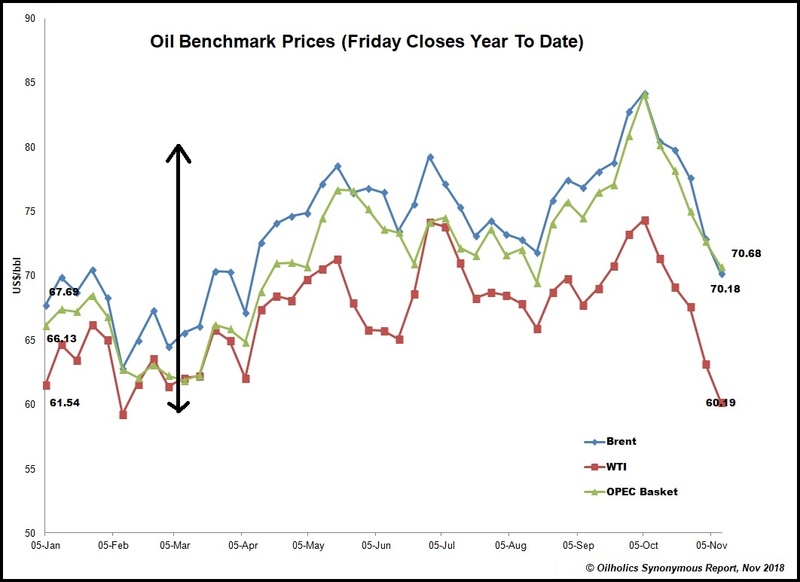 Overall, crude prices have slumped by 30% over the last 7 weeks; quite something given the amount of bullish nonsense that was on the airwaves prior to the slide. If this isn't a slump, what is? Especially, as Brent also slid below $60 per barrel. Not so long ago, the global proxy benchmark was approaching $85, leading to typical exaggerated market forecasts in some quarters that the benchmark would hit $100 over Q1 2019. Those who never believed such predictions, including this blogger, and expressed a net-short position ought to feel vindicated. The froth has gone out of the market, and sentiment remains largely bearish. However, there is such a thing as an 'over-correction'. The Oilholic thinks the slide has been too steep, too fast because the macroeconomic dynamic on the supply side has not undergone a similar sentimental slump. The Trump-China face-off, global growth rate (which is steady but not quite firing up), possibility of European upheavals (Brexit, Italy, Greece, Spain, etc), and an unimpressive oil demand growth range of 1.1 to 1.4 million barrels per day (bpd), were all priced in when the WTI was lurking in the $60s and Brent in $70s. That for the Oilholic was the optimal range/level for both contracts, before the so-called false prophets exaggerated the impact of Iranian sanctions slapped unilaterally by the US on Tehran. Hedge Funds and money managers then piled in, as they tend to with jumped up net-long calls, in the hope of extending the rally and Brent hit thoroughly unmerited $80+ intraday levels. Therefore, when the initial correction hit, dragging Brent first down to $70, and subsequently below, it was merited. However, the Oilholic believes we are in an over-correction patch now. The market is in a real danger of swapping one extreme for another, and as usual the false prophets are it again, with some predicting a slump to $40 and below. The volatility of the last few weeks has delivered a classic lesson on why not to trust them. Moving on from 'crude' rants, the Oilholic was delighted to speak at the World Energy Council's (WEC) Vienna Energy Summit, which is what the early morning departure from Heathrow and earlier than usual scrutiny of oil prices in East Asia - should you follow one on Twitter - was all about. The summit addressed a number of crucial subjects, and gave due weight to the macroeconomic and sociopolitical climate beyond current and future permutations in the energy markets. Fellow panellists and yours truly deliberated, Saudi Arabia's transformation (at least on paper) to renewable energy, impact of regulations on the oil price and world order, petro-yuan hypothesis, those inimitable Donald Trump tweets and diplomacy by social media, Iran sanctions and much more. 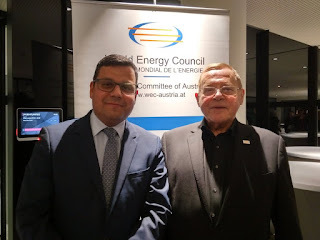 It was a great industry dialogue, and a pleasure finally connecting with Dr Robert Kobau, Secretary General of WEC Austria (above right). With so much ground to cover, the session just flew by and animated, good spirited discussions spilled over to the after event reception, as how industry dialogues should be. All the remains, is to say it's time for the big flying bus home! Keeping reading, keep it ‘crude’! © Gaurav Sharma 2018. Photo: Gaurav Sharma with Dr Robert Kobau, © Gaurav Sharma 2018. 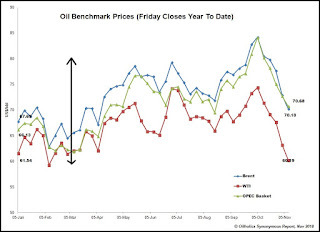 What a commotion we had in the oil markets last week, when Tuesday's (November 13) session saw an intraday decline of 8% for the West Texas Intermediate, and a near similar drop for the Brent front-month contract. 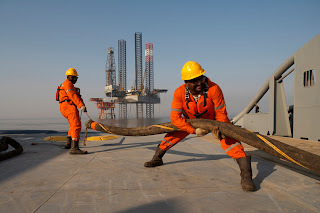 Long calls unravelled in higher numbers as the market increasingly came to the realisation that there was still plenty of crude oil in the market regardless of the Trump versus Iran situation. Of course, as it tends to happen, when the market oversells or overcorrects, a recovery run follows. As it were, come Friday, Brent was down by 4.87% and WTI was down 6.19% on the previous week’s closing position. If nothing else, what the selloff did was ensure a puncturing of bullish illusions and flag up the fact (again!) that three crude oil producers alone – US, Saudi Arabia and Russia – were pumping more than all of OPEC, albeit with very different geopolitical agendas of their own. The sudden decline also makes for an interesting OPEC meeting scheduled for December 6. Nonetheless, the proof is in the 'crude' pudding – i.e. the latest CFTC and ICE data which points to a decline in global net-long positions. Starting with Brent contracts – for the week ending November 13, money managers' net long positions fell 17% to 214,832 contracts; the lowest level on record in nearly 18 months. Concurrently, WTI net-long positions fell 5.2% to 151,984 futures; the lowest since August 2017. Anyone for $100? That's all for the moment folks! Keep reading, keep it ‘crude’! 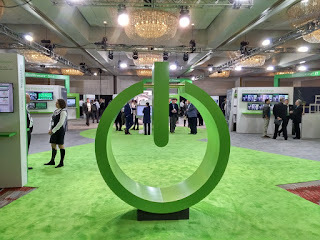 The Oilholic finds himself at Schneider Electric's North America Innovation Summit 2018, here in Atlanta, stateside, and what a first day its been. North America accounts for nearly 27% of the global energy management and automation giant's headline business, and is home to several of its innovation hubs, making Atlanta a perfect place for the latest round of its innovation summit series. Unsurprisingly, the company is using the occasion to reveal several new announcements, the most eye-catching of which (so far) has to be the launch of a dedicated venture capital funding arm. The unit called Schneider Electric Ventures would have around €500 million of dry power to invest in new tech ventures (See The Oilholic’s detailed report for Forbes here). But the buzzword for the event is – 'EcoStruxure' – Schneider Electric's Industrial Internet of Things (IIoT) architecture conceived to deliver "smart machine" solutions within the energy sphere. To quote the company's Chairman and CEO Jean-Pascal Tricoire if you still haven't heard about it by the time the event comes to a conclusion, well you really haven't been here. EcoStruxure's innovative pathways run along five slants. First there's EcoStruxure Power, a solution that deploys the IIoT premise to strengthen power management capabilities with advanced monitoring and analytics. It is also designed to improve operational safety, reliability and efficiency. Then there's EcoStruxure Machine to deliver advanced smart machine solutions, including connectivity, control, tracking and monitoring. You'd be surprised if there wasn't an EcoStruxure IT platform, which you've probably guessed is a cloud-based solution for improved monitoring and visibility across the entire data center ecosystem. EcoStruxure Grid solution is where you'll find Schneider Electric in its element as an industry leader; the solution is an enhanced microgrid offering aimed at maximising "onsite renewable energy penetration and simplify power management." And finally, EcoStruxure Building offers to fortify occupant engagement, optimise space utilisation better and empower personalised environments. For Schneider Electric, the direction of travel is clear – IIoT need not be a phantasm. 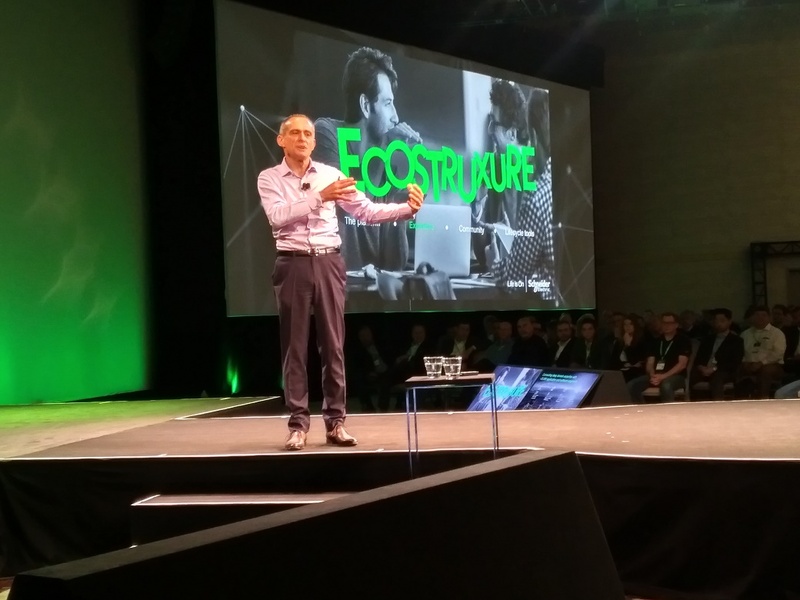 It's here, it's now, it's accessible via EcoStruxure solutions, says Tricoire. In his keynote address to over 1,400 attendees, the boss added: "How IoT will change things meaningfully is yet to be written, the journey is just starting. But at the same time IoT is more accessible that you think. We will continue to introduce new additions to the EcoStruxure architecture in step with the digital transformation of industrial automation markets." Analysts here, including yours truly, believe we'll get more of the same from the company, with its connected products, edge control software, apps, analytics, and services, and more. It is the inexorable direction of travel in a digital economy. And Tricoire rightly notes that digital is not a zero-sum game. That means collaboration between energy and utility sector clients will bring about an integrated approach to energy management, and the boss' favourite topic – greater energy supply reliability and efficiency. Tricoire also said data and energy go hand in glove. "Major demand and consumption growth of electricity is coming from the proliferation of IT and datacentres. Nearly every new innovation uses electricity." So expect plenty more innovations under the EcoStruxure umbrella. And well, on a day both Brent and West Texas Intermediate oil futures contracts are down by over 7%, Tricoire says Schneider Electric sees "enormous opportunities" with the world moving from a largely fossil fuel-driven economy to an electrified economy! Bring in the noise people! That's all from Atlanta folks! Keep reading, keep it crude! © Gaurav Sharma 2018. 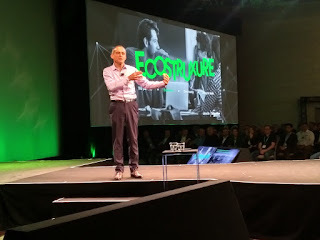 Photo 1: Schneider Electric Chairman and CEO Jean-Pascal Tricoire addresses the company' Innovation Summit in Atlanta, Georgia, USA. Photo 2: Schneider Electric Summit's Innovation Hub. © Gaurav Sharma Nov 13, 2018.